The artists’ book is usually sequestered away in library stacks and drawers in their neat little custom made archival cardboard boxes and plastic bags. In specialised library and private collections these are treasured objects; their owners become the custodian of the physical object of the book and the story is revealed in the site-specific act of reading within these spaces. But … sometimes they escape. On occasion artists’ books escape en-mass from their natural home of the library or private collection, and this is exactly the case with the exhibition Life’s Journey recently presented at the Redland Art Gallery, Cleveland. Co-curated by Emma Bain Director of Redland Art Gallery and Anna Thurgood Acting Director of Artspace Mackay, the exhibition assembles books drawn from the significant, perhaps one could say—international quality, collections found in Queensland; Artspace Mackay (AM), grahame gallies + editions (gg+e), the State Library of Queensland (SLQ) and Studio West End (SWE). The exhibition’s themes, as highlighted in the catalogue essay by Louise Martin-Chew claim that they are intended to seek ‘out universal truths in individual journeys’, ‘the personal and individual’, …and ‘artist narratives with memoir-like threads’. The viewer entering the gallery to see the Life’s Journeys books may not have read the catalogue, or have an understanding of the artists’ book discipline, but what they are to encounter in the white cube of the gallery space will be unusual. 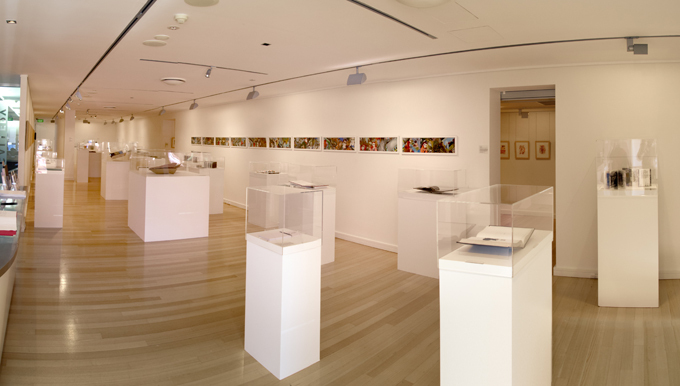 The Redland Gallery’s main room a literal forest of fourteen or more acrylic topped display cases. Inside each case resides the book, open to a page and resting on a stand or pillow. Some books don’t seem like books at all, they look more like 3D sculpture, or jewellery forms, or even things just fastened or bound together by threads. Other ‘books’ are in frames or on panels on the wall—one is even a projected image. 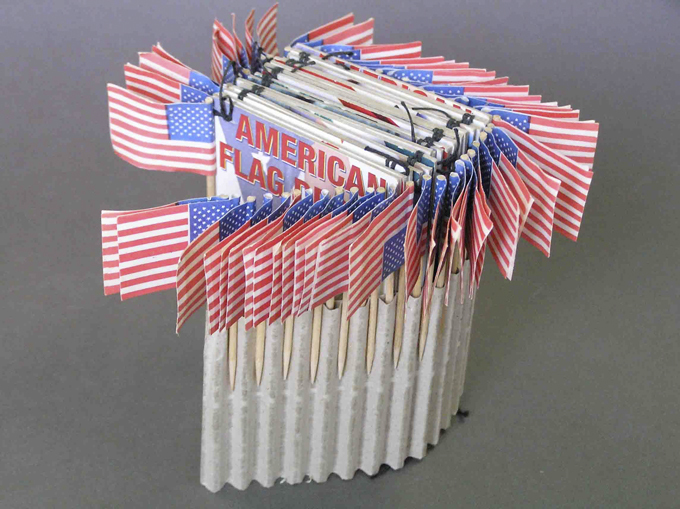 It’s here where the viewer becomes acquainted with the ‘non-standard’ nature of the artists’ book—but there is more… The viewer can look at the narrative segment presented by the open page, or the expanded story presented in the wall-mounted works, or books that are of the concertina form. While being visually entertained by the titillating ‘sample’ view, the visitor may probably enjoy the encounter and will leave feeling a sense of discovering something interesting and unusual. But I would suggest that this is only part of the experience that the artists who made the books expected or wanted for those who see their books. I know that this sounds like the continuing debate about the gallery exhibition of books where the sequential narrative that artists’ books require is neutered by single page views. But there is an issue, and for me a redeeming feature for shows like this, and that is that the display of artists’ books will encourage and excite people to hunt down these books in their usual library-sited storage spaces. What I have written about before,* and what I will restate is, that these exhibitions are ‘tasters’ only. The exhibition strategy needs to include ways by which viewers can identify books of interest, understand how to access them, and then go-see, handle, read and fully encounter the artist’s communiqué. What is needed for the gallery viewer is a catalogue of the books and their source collections, how to access these collections, online references (maybe even flip-books of the works), perhaps even initiated within the exhibition space by QR codes or augmented reality clips. Using this concept the exhibition becomes an invitation for those who wish to take up the offer to handle and read the books in their site-specific habitat. Now that’s off my chest, I have to say what an amazing collection of artists’ books the curators have pulled together. Seeing this cherry-picked selection in this context is far more interesting for me than looking through an online catalogue—here there is a sense of discovery. It’s a bit like going to a second-hand bookshop and just wandering through the stacks picking up whatever takes your fancy. Wandering through Life’s Journey was indeed an encounter with an eclectic bunch of artists’ books. Some of my favourites were there. This included Adele Outteridge’s Teabag Book (2005) from SWE – just how many cups of tea were consumed to make this book? And another of Adele’s books, God Bless America (2003?) also from SWE, makes a political statement that can be read in different ways depending on the reader’s point of view of American society or foreign policy. Another book Naru (2007), from the SLQ, was constructed from paper to form a 3D vessel—the book as a metaphor for a boat. The work was the result of a collaborative project entitled Codex Event 4 coordinated by Tim Mosely at Southern Cross University. Naru and the other books that were created by the team have an overtly political statement contained within their shape and the titling. These works comment on idea of the freedom that many people seek as they cross borders as refugees and how this conflicts with the Australian Government’s immigration policies. 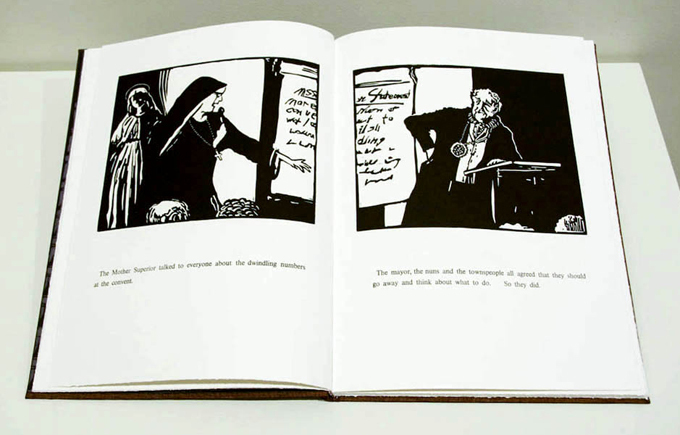 A fine press/printmakers book is represented by Sheree Kinlyside’s The reluctant nun (2009) from AM. The book was the winner of the Regional Artists Book Award at the 2010 Libris Artist Book Awards. A book of a different shape, five sides(!) by American book artist Philip Zimmerman High Tension (1993), from gg+e, deals with a humorous look at contemporary society. The book is intentionally over-designed, montaging graphic elements and text with image narrative to make it an immensely interesting book—you want to pick it up and read through. In the display of another book, Judy Watson’s Under the Act (2007) from gg+e, each page is framed and the work extends across one complete wall of the gallery. The folio single-sheet form of this book enables its reconfiguration to the wall possible. The work describes a personal narrative, a life’s journey, through the impact of oppressive white bureaucracy applied to Aboriginal peoples living in Queensland not that long ago. Peter Lyssiotis and Noga Freiburg’s collaborative book Homeland (2003) from AM presents personal narratives of the authors, one a Greek Cypriot—the other an Israeli, about the way lines are drawn across maps to divide communities. The book invokes the story concept by using texts, family photographs and photomontages all bisected by a green line that divides the two communities. 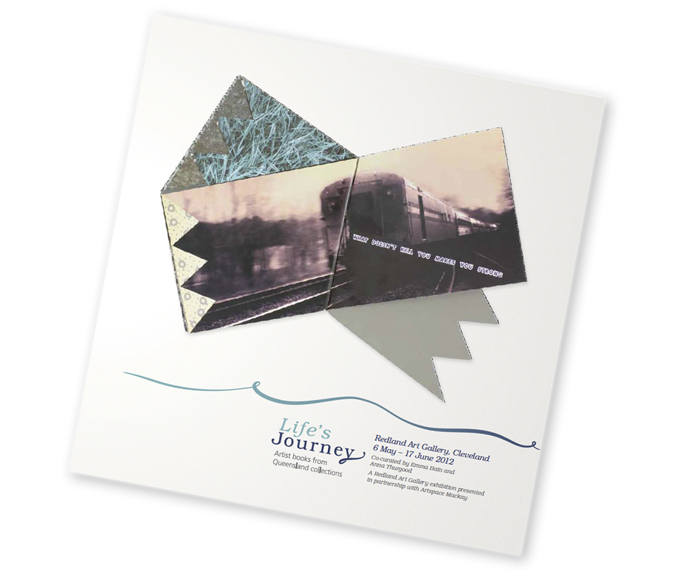 Life’s Journeys is a significant showing of what artists’ books can be and it puts the book firmly within the art gallery display environment. But none-the-less, with all the problems of display and the expectations that this commentator may have, the books do need to get out and about. They assert by their presence in the gallery that they exist and can be encountered by a diverse range of the art-interested public. And, perhaps is the case with any gallery exhibition, the viewer experience is something that develops and is enhanced by continued reflection after the viewing. The importance of the exhibition Life’s Journey, the accompanying exhibition Mind Mapping by local artist and bookmaker Jack Oudyn, and the associated workshops is that they will create much needed interest, scholarship and activity in the artists’ book genre. …. And hopefully inspire some viewers to become readers by pursuing the fuller of the artists’ book communiqué by engaging more fully with them when the books return to their respective collection homes. Please note: The links that I’ve selected to provide a visual connection with the text have been sourced from Google images and may not be the exact book presented for display in this show. I have found it interesting to discover how so many artists’ books are poorly, if at all, represented in the online domain. As the book fades into history as an artifact I wonder what will be the future of the artist book. Its strength has been an association with the charactersitics of a familiar object, but as the traditional object ‘book’ becomes more unfamiliar with successive generations so I can see that the object ‘artist book’ might become obselete, a sterile thing of the past. For my own part it already feels strange to read a traditional paper book, and I wonder if in the future many of these artworks will need to be explained in term of their relationship to an anachronistic way of reading. So, I think you are right, the idea of sequence and unravelling are important elements in understanding and appreciating artist books, because these are the elements of ‘book’ that survive into new formats like ebooks, or video, or transmedia storytelling. In my own exploration of why artist books have fascinated me as part of my practice I now look more to the idea of reading than the object book as the way forward. This is not to undermine the value of these workks as sculptural objects, but, I think, to be meaningful their intrinsic value has more to do with the process of reading than the object itself. Hi Catherine – Yes, it’s quite a challenge being the ‘everything else’ that you need to be when you just wanna be an artist today. A blog about a book or an activity like you mail art projects can work very well to show others what you are up to. This works for us and many people that we connect with. After all the activity last week we are back home and will do some work on your show review – It’s really a great body of work. Did enjoy your sense of story… Will send some pics thru to you. Cheers. Doug and Vicky.